Your holiday starts when you step into our camper. With its 5.99 meters it is very compact and wonderfully comfortable. Parking in a city is not a point. He will take you to the most beautiful places in Europe! The choice is yours. 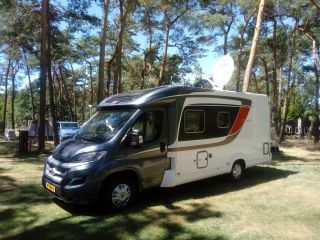 There are camper guides with over 1200 campsites and camper pitches in Europe. The year of construction of the camper is 2015 and it is built on a Fiat chassis. The engine is a 130 hp MultiJet turbo diesel, which is very economical. You sleep is a fixed bed in the width of the camper. The solar panel contributes to the fact that you are much less dependent on external electricity. The inverter then supplies you with 230 volts. a 100 liter water tank. 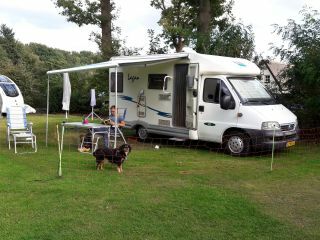 We expect you to clean the camper yourself, thoroughly inside and on the outside the worst dirt and flies. If we do it the cleaning costs are € 100, -. Linens and towels are not included.